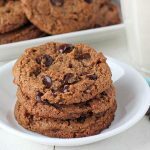 Like all of my cookie recipes, these vegan almond butter cookies are super easy to make…and quick! So that cookie craving you’re having? You can have that taken care of in under 30-minutes! 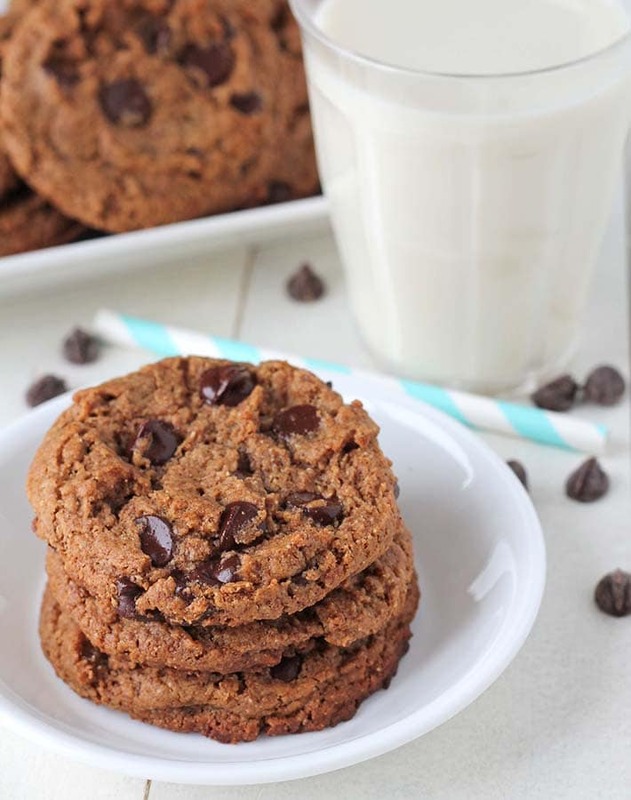 For these almond butter cookies, I went back to my peanut butter oatmeal chocolate chip cookies recipe, took the oats and oat flour out, swapped the peanut butter for almond butter, and ended up with this easy almond butter cookie recipe. Not only are they vegan, they’re naturally flourless / gluten-free and very quick and easy to make. Before I walk you through the steps to making this perfect vegan gluten-free cookie recipe, let’s talk cookie sheets. I recently treated myself to a brand new cookie sheet with an Amazon gift card I was given and I LOVE it. It’s by the same bakeware company I’ve told you about in other posts, USA Pan. high-quality, durable, and it will last you a very long time if you take care of it. This cookie sheet is a little different because it has a raised edge that makes putting it in and taking it out of the oven even easier. If you’re looking for a new cookie sheet, I highly recommend this one! You can see it here on Amazon. How Do You Make Vegan Gluten-Free Almond Butter Cookies? As mentioned, this recipe is EASY. 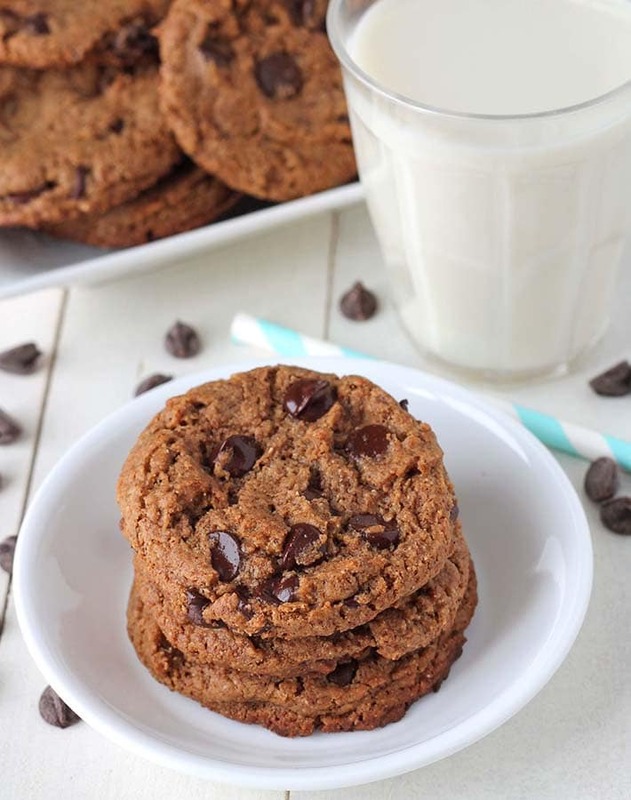 There are just a few simple steps standing in between you and these vegan almond butter chocolate chip cookies! First, you need to mix all of the ingredients, except the chocolate chips, together. 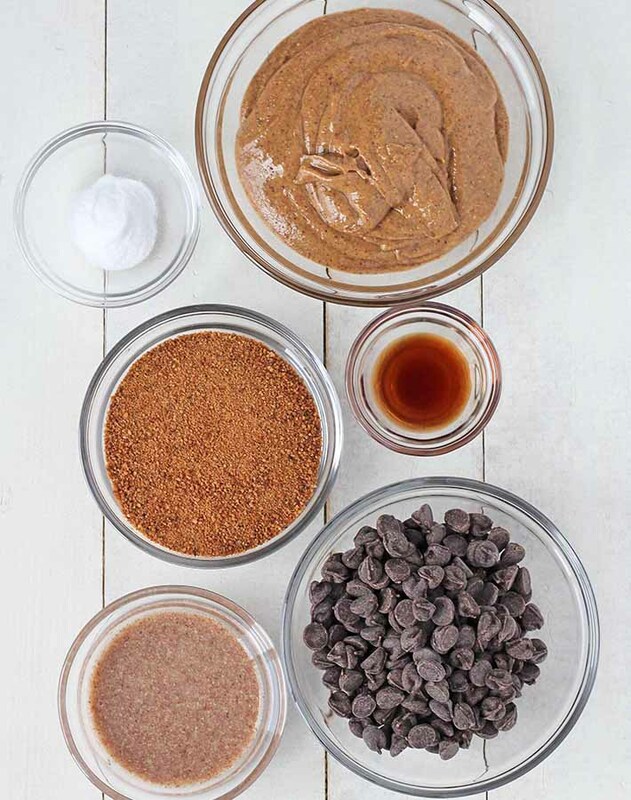 Once all of the ingredients are combined, add the chocolate chips and mix again. Next, using either a tablespoon or a medium cookie scoop, scoop the cookie dough out onto your cookie sheet. Then you’ll flatten each cookie slightly. They’ll spread as they bake but you want to give them a little head start so they come out perfect. When your almond butter chocolate chip cookies first come out of the oven, they’re going to be very fragile. Don’t even attempt to take them off of the cookie sheet or they will crumble and fall apart. Be patient and let them cool before you dig in. That part is hard, I know, but trust me, the wait will be worth it! Just look at this cookie! What is the Best Kind of Almond Butter to Use for Almond Butter Cookies? The almond butter is a very important part of this recipe. Since these cookies are flourless, it helps to function as the flour. I use natural almond butter for this recipe, the kind that is separated when you buy it and you have to stir it back together. The ingredient list should just have one ingredient: roasted almonds. You don’t want an almond butter that has a bunch of extra, unnecessary ingredients like oil, salt, or sugar, etc. because that will throw off the flavours and texture. For best results, stick with a natural almond butter, the type I’ve described above. 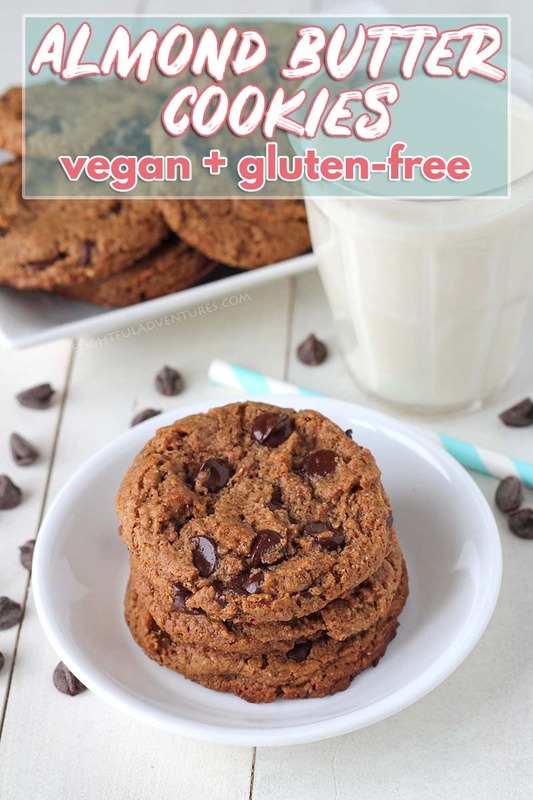 Where Can I Find Vegan Chocolate Chips? 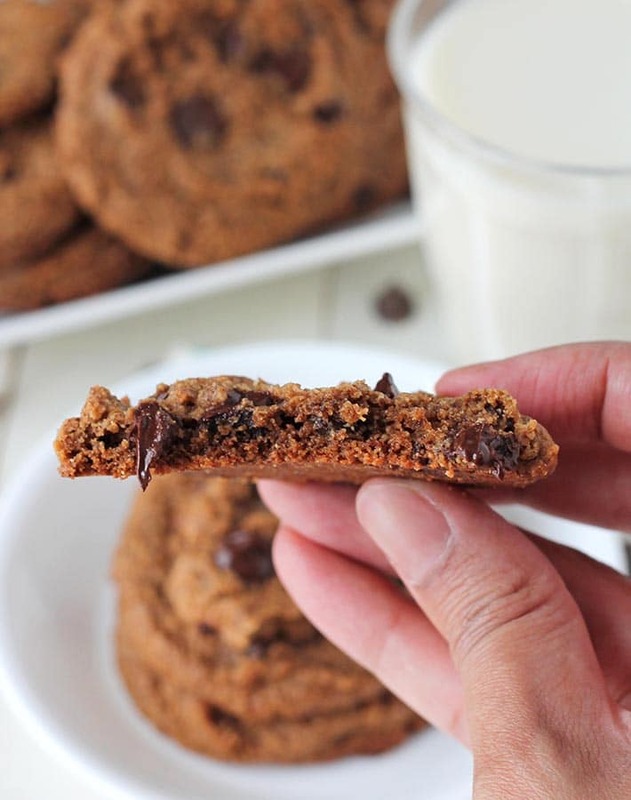 I use semi-sweet / dark chocolate chips in all of my baking, including these chewy almond butter cookies. Most dark chocolate chips are vegan, but to be 100% sure yours are, read the ingredient list and look out for dairy ingredients. Here in Canada, President’s Choice decadent semi-sweet chocolate chips are vegan and very easy to find (it’s what I used in this recipe), and there’s also Enjoy Life, Made Good, or Kirkland Signature at Costco. In the US, you can use Enjoy Life, Kirkland Signature from Costco, or check at stores that sell a good selection of vegan products like Whole Foods, or Trader Joe’s. And if you prefer peanut butter cookies, you may like these vegan gluten free peanut butter cookies instead. If you happen to make these egg-free almond butter cookies, tell me about it in the comments below! Or instead, you can post a pic to Instagram and tag me. I’d love to see your remake! I’m @delightfuladventures! You can also pin this simple vegan cookie recipe to one of your boards on Pinterest so you can help me to help others find it. Thank you! 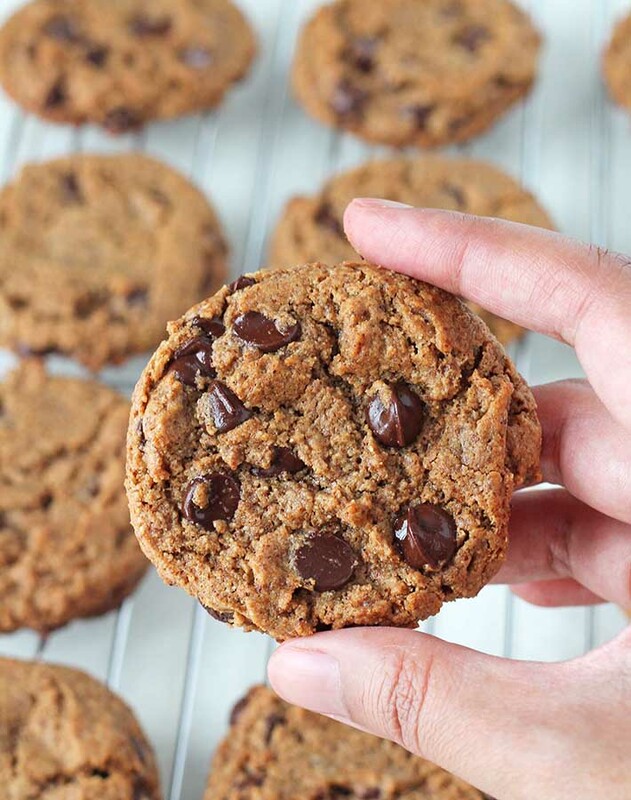 Bake up these soft, chewy, flourless vegan almond butter cookies & you'll be glad you did. They're gluten-free, packed with chocolate, and so easy to make! Prepare your baking sheet(s) by lining with parchment paper, if needed. 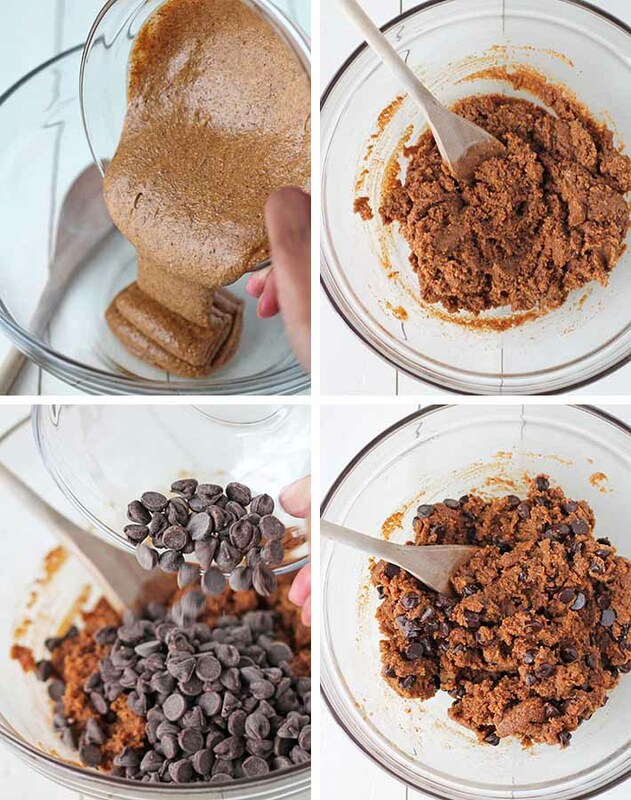 In a medium bowl, add almond butter, coconut sugar, baking soda, vanilla extract, and flax egg. Mix until all ingredients have combined. Flatten each cookie slightly. Leave enough space around each cookie, they will spread as they bake. Bake for 10 minutes, don't over bake! Leave cookies on the cookie sheet to cool for about 15 minutes, then remove and place on a cooling rack. Please read all of the helpful tips and info above before making this recipe to make sure your cookies turn out perfectly. 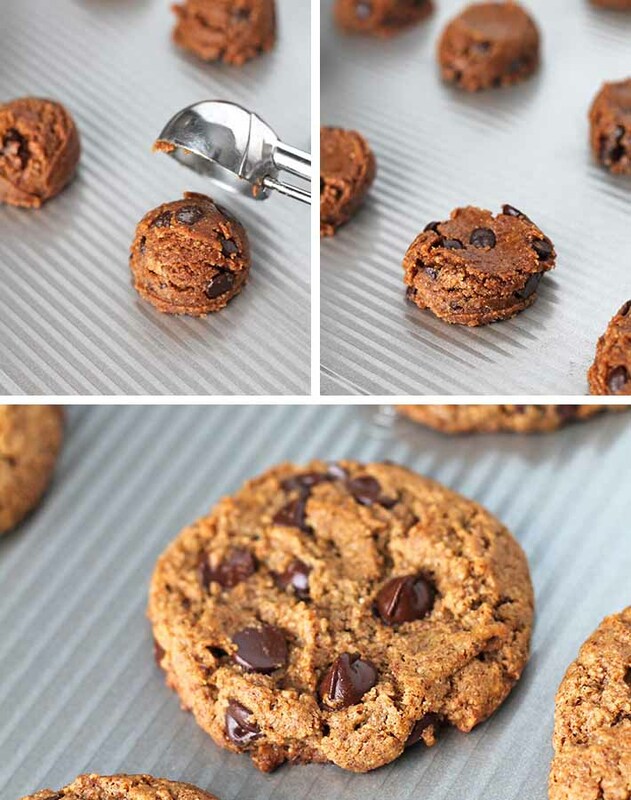 This recipe will make 22 cookies if you use a tablespoon to scoop them out. If you scoop them with a medium sized cookie scoop, (medium scoops are usually 1.5 tablespoons), you will end up with about 16 cookies. I have only tried making this recipe with natural almond butter, the type that only has ONE ingredient: roasted almonds (the type you have to stir to combine the oil with the almond butter). If you use a different type of almond butter, your results may be slightly different than mine. I also tested this recipe with brown sugar and the results were great, but I found that the version with coconut sugar produced a slightly chewier cookie. The cookies may seem under baked when you take out of the oven because they'll be very soft. Not to worry, they firm up as they cool. Be sure to leave them to cool on the cookie sheet for at least 15 minutes before transferring to your cooling rack. If you remove them too quickly, they will fall apart. Nutrition info listed below is based on one of 22 cookies and the recipe made as written. Nutrition info is only to be used as a rough guide. Click here to learn how nutrition info is calculated on this website.